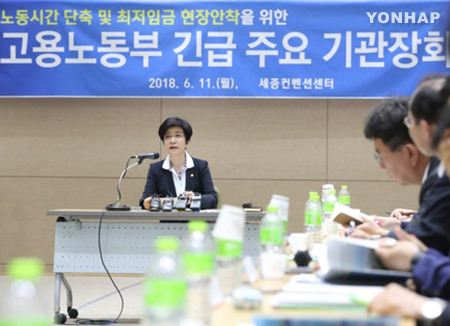 The Ministry of Employment and Labor on Tuesday announced guidelines for reduced maximum weekly working hours which will go into effect from next month. The move comes after the National Assembly in February passed a bill to reduce the maximum weekly working hours from 68 to 52 to pave the way for an improvement in work-life balance. Under the guidelines, hours in which employees are on stand-by, receive training and meet clients will be regarded as working hours. Hours spent on business trips abroad, including flight hours, will also be recognized if there is a written agreement between labor and management. The labor ministry said hours spent under an employer’s supervision should be counted as working hours but time spent on interactions among employees outside the office that have nothing to do with services will not be recognized.